Gear up for Cycle to Work Day and beyond with Cyclescheme. Spread the cost and save 25 - 39% on a new commuting bike with Cyclescheme. Plus, choose a Cannondale or Specialized bike priced £500+ and bag a FREE £30 card to spend in-store. To benefit from Cyclescheme, your employer needs to be on-board first. Luckily over 9 million UK workers already have access to Cyclescheme – and you could be one of them. Visit 'Can I apply' for more info on getting your Employer Code. Once you have your Employer Code to hand, click 'I'm an employee' on our homepage, enter the code and hit ‘Let’s get started’. You can now apply for your Cyclescheme Certificate. You can either pick your bike upfront at a Cyclescheme retailer of your choice or you can just select a value by 'deciding later'. 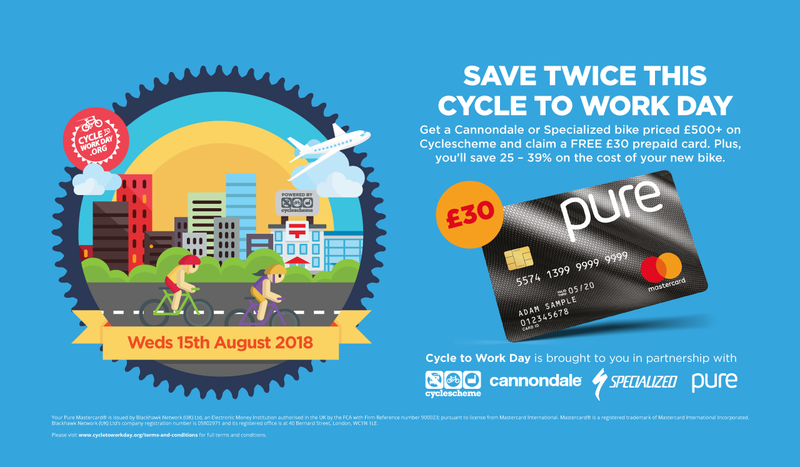 To bag your FREE £30 prepaid card, you need to redeem a Certificate for a Cannondale or Specialized bike worth £500 or more during July or August. Redeem this online or in-store with a Cyclescheme retailer. Find your preferred Cannondale or Specialized retailer using our 'Retailer finder'. As well as a receiving a FREE £30 card, with Cyclescheme you save 25 – 39% on the cost of your new bike. Visit 'How it works' for more info. Your employer approves and pays for your request upfront. Cyclescheme sends you a Certificate to redeem against your new bike. Collect your bike and then claim your FREE £30 card. Head to redeem.cyclescheme.co.uk and enter your Certificate reference number and your email address, and we’ll deliver your card direct to your door. Revisit your retailer (in-store or online) and spend your FREE £30 card. Treat yourself to some new cycle accessories or your new bike to a future service. You can spend your card in one go or across multiple transactions over a 6 month period.